North Sea Workwear supplies cut resistant gloves ranging from the lowest, Cut 1 level, through Cut 3 and up to the maximum Cut 5 gloves (ie level 5 of cut protection). 1) How sharp are the items you may be handling? - the sharper, the higehr the cut protection that you need, with Cut 5 protection being the highest available. 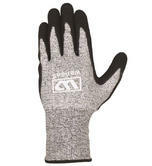 (No glove is cut proof, but cut 5 typically uses bullet proof Kevlar or Dyneema to achieve the highest cut protection). 2) What level of dexterity do you require? 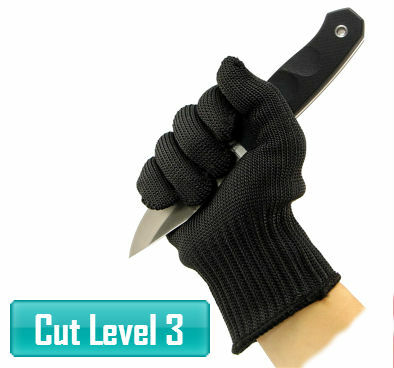 - typically the greater the cut protection, the thicker the glove and the less the dexterity. The ATG Maxitherm still maintains cut level 3 protection, despite being super thin - only 0.75mm thick of material! 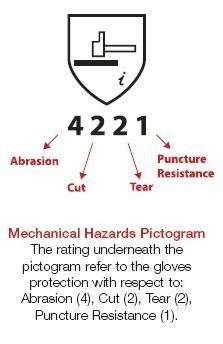 In essence, on the EN 388 standard, the difference between a Cut 1 glove and a Cut 5 glove certification is that the cut 5 glove has passed 20 cycles of a rotating blade against the glove, whereas the Cut 1 glove has only survived 1.2 rotations of the blade. The new EN ISo13997 standard will measure the pressure of any given blade (eg a Cut 5 glove will have to withstand 22 Newtons of blade pressure).